Here are a couple of pieces that I made in 1982, when I was transitioning from 3d sculptural work to flatter, framed pieces. I started using the term “fabric relief” about then because people kept asking what they were called. It’s still hard to explain what I do at cocktail parties! The water coming out of the hose is metallic thread. 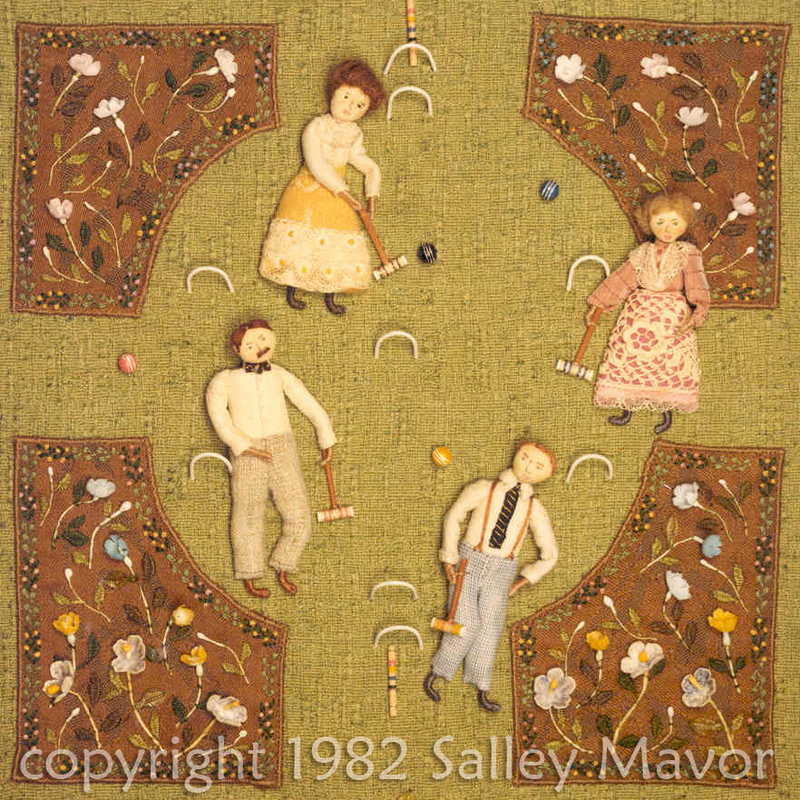 The figures playing croquet are very early “wee folk” with cloth heads instead of the painted wooden ones I use now. This is a detail from the strawberry garden scene in a illustration from Mary Had a Little Lamb. The stones were glued onto the velveteen background fabric. 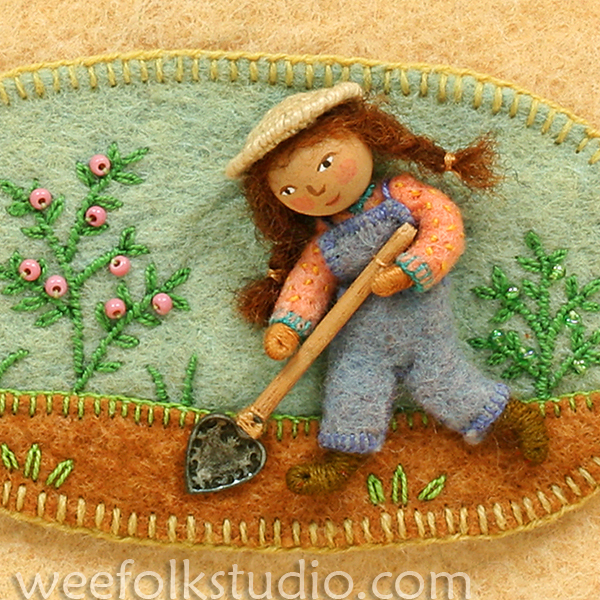 Here’s another Mary character in her garden, this one from The Hollyhock Wall. 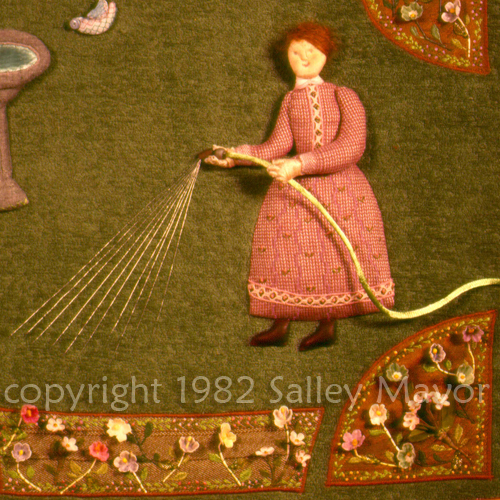 Her hair is wool fleece and the background is embroidery on dyed velveteen. “Eleven, Twelve, dig and delve”. This illustration is part of a rhyme in Pocketful of Posies. The straw hat is made with thread wrapped wire and the spade blade is a heart charm. 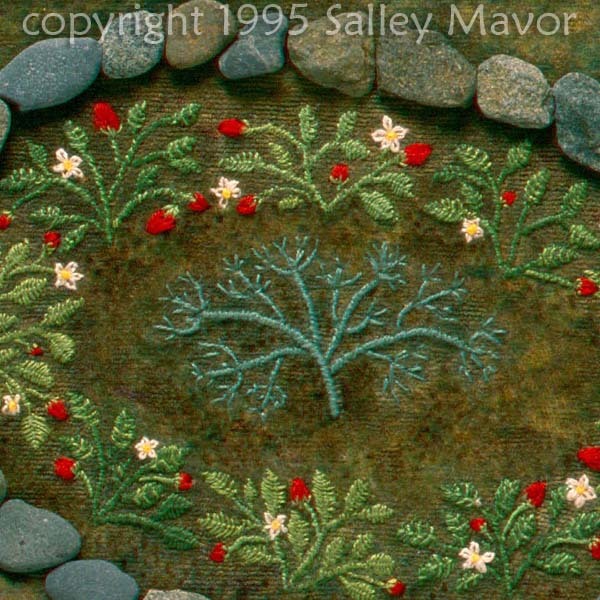 This entry was posted in Children's Books, Closeups, Fabric Relief, Felt, Garden, illustration, Nature by Salley Mavor. Bookmark the permalink. How beautiful. I would like to go for a walk in any of your gardens. Love the sunburst effect of the metallic threads for spraying water – perfect. Salley – you always have such unique trinkets as part of your pictures -a hinge here, piece of jewelry there…. do you stockpile all of these wonderful things or are you just always on the lookout for something that you can eventually use – or both!! I have SO MUCH stuff, that I never have to buy another thing! I want to play with ‘Eleven, twelve, dig and delve!’ She is such a delight. I am always so intrigued by the perfect little hands, how do you do that? Think you should produce another “how to” book. Thanks for your interest in the hands. I figured out how to wrap the hands a long time ago and over time they’ve gotten smaller and smaller, with some less than 1/4″ long. Others have asked if I would do another how-to book and I just can’t bring myself to take on such a big project. To do a good job, I would have to stop everything else for a year, no new artwork, no blog, etc. The truth is that I have no idea how to break down the process in a teachable way. I guess that I’m just not ready or willing to take the time to analyze my method, but want to get lost in that state of bliss. OH, my word, the lady and her watering is so wonderful! I love the garden details, too. I don’t blame you for not wanting to stop to make a new “how-to” book. I find that there are so many resposibilities in a day that there is never enough time for artwork. I also understand the bliss you experience in creating. We love to see what you do, so enjoy, Salley!!!! I would love a new “how to book” as well but can understand why you wouldn’t want to take on such a big project. Everything you posted is so wonderful…especially love the croquet game…so charming! PS….I would love to look in your “stuff” boxes! Isn’t it fun to find little pieces that you know you are sure to need, one day? Does your family shake their heads at your “finds” or do they actually find things for you, too? I come from a long line of collectors, so no one thinks what I do is out of the ordinary. People do bring things by my studio occasionally. I could do without the bags of polyester cloth scraps, though! as usual totally breathless! Are you planning a “how to book”? I want one!!! Can’t pick a favorite! Sorry, but there are NO plans to do another how-to book. Please see my comments above. As always, so beautiful! Your attention to detail is amazing! Thank you for sharing these wonders. Hmmm, if not a book, maybe an article for Cloth, Paper, Scissors or another such magazine of ONE project!? That would be an idea! I have to say I love the spray from the hose, too – what a great idea! That, and the “Hollyhock Wall”…shall I count the ways I love it? 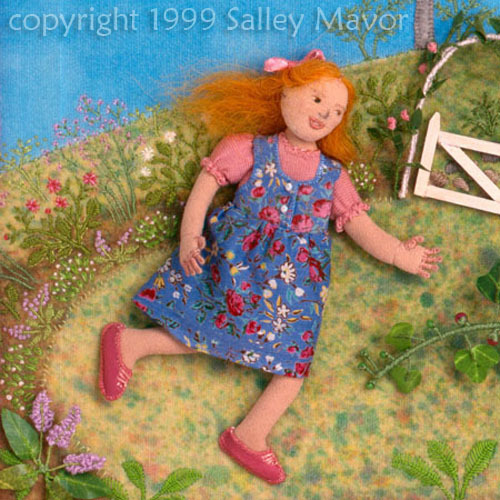 The perspective, the scale, the blue you chose for the curving sky, the way the fabric in the dress repeats the plants growing behind the sweet happy redheaded girl (who is wearing pink! Her tight little elastic gathered sleeves! )…The mottled background she is standing on…it looks like you spatterpainted some wool! The little rose arbor and the gate….all just sublimely satisfying, Salley. The spatterpainted velveteen is just great! There’s a post about the rocks. E6000 is just glue from Michael’s….the buttons are threaded with long tails (using strong thread like Silamead or beading thread), then glued to the back of the rocks. So it isn’t a new product, just a desperate solution! When the glue is dry, I thread each tail into a needle, bring it to the back of the piece, then tie them all in triple knots. The rocks stay on well. The post I linked to has some pics so you can see. Thanks for this information, Allie. You’ve devised an ingenious way of attaching stones to fabric. Sally, I have your glorious book Wee Folk. I just happened upon your site through Craft Gossip “Inspirations”. I think your work is just marvellous.I love dolls and have made dozens after I got your book.I must make some more! !I would LOVE to see your studio!! !